National Accident Helpline in the UK is running “Knocked Down”, a television commercial featuring Underdog and the 1997 Chumbawamba hit Tubthumping. 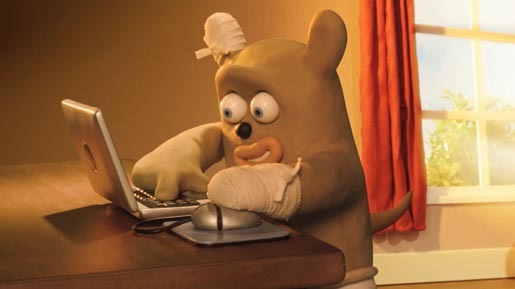 Underdog, the animated character produced at Aardman, struggles with injury, gets to his feet and uses a laptop to contact National Accident Helpline for help. The campaign connects viewers to the site, underdog.co.uk. The Knocked Down campaign was developed at CST The Gate by executive creative directors Dave Trott and Gordon Smith, and agency producer Serena Freeman. Animation was produced at Aardman by director Danny Capozzi and producer Lynn Hollowell. Sets were produced at ScaryCat Studio. Post production was done at Prime Focus by colourist Tom Russell, Flame artist Derek Moore and VFX post producer Sara Beckman.